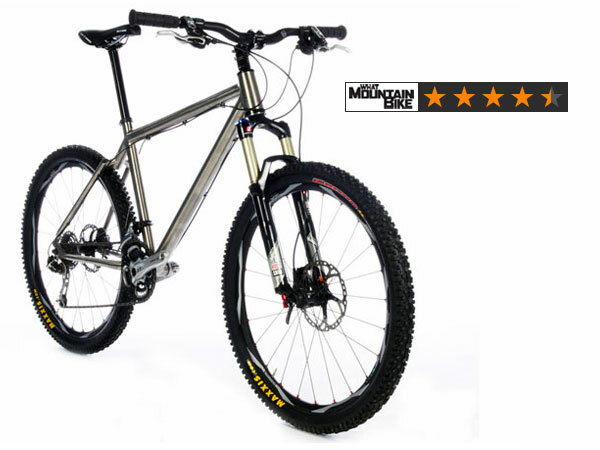 The latest incarnation of the "Best Hardtail Ever" On-One Ti 456 just got a big thumbs up from What Mountain Bike Magazine- this time scoring a rare 4.5/5 in this month's review. Those lucky journo types over at What Mountain Bike Magazine recently got chance to run the rule over our much sort after Ti 456 test bike. As it turns out they liked what the rode, awarding it an impressive 4.5 stars out of 5! They were particularly impressed with the way the frame retained the same premium build quality and great ride feel that the original Ti 456 was renowned for. Plus they appreciated the little performance enhancing tweaks we've made to what is now essentially a truly classic mountain bike frame. - A tapered head tube designed for the latest tapered steerer forks, resulting in a stiffer head tube area. - ISCG 05 mounts allow chain retention devices to be fitted, ideal if you'd like a little extra chain security while rattling downhill. - Swapouts give the choice of gears or singlespeed, with a bolt-through dropout on the way too. - 31.6mm seat tube, perfect for those fancy new-fangled dropper seatposts. Click here to pre-order the Ti 456 XT Pro bike while stocks last! The flagship On-One titanium trail bike has always been a premium build but now with Rockshox Revelation RLT Ti 20mm Maxle forks and the superb new Max 32 Maxle wheelset as well as sporting a FULL Shimano XT drivetrain (including cassette, chain and chainset) and Schwalbe Nobby Nic Evo tyres it is now more capable than ever! Click here to pre-order the Ti 456 XT Pro now. Frames are arriving at the end of this month so get your order in now- stocks are limited! Click here to read a scan of the What Mountain Bike review. Any idea when the 456 Ti will be back in stock? Pretty keen on a full build from you guys to take with me to Norway! I'm afraid we're out of stock of Ti456's at the moment. Looking for Ti 456 size 16.5" any stock? have you got an accurate KG weight of the Ti without peddles? This is truly epic, I would love one of these! Hi Jeremy, there's no plans to do Ti 456 Summer Season as of yet, I was merely saying to Tyler that I'd pass the idea on to our designer! You can order your Ti 456 safe in the knowledge it won't be superseded any time soon! any ideal when the 456 summer season ti will come out ? am planning to get the 456 ti in a couple of days and dont wanna bang my head on the wall when the 456 ti is released.